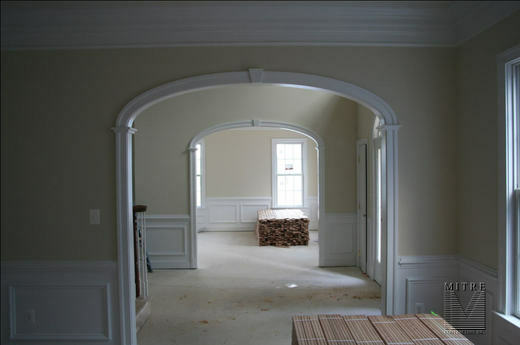 The arch features recessed panels, applied curved panel mouldings, a keystone detail, all wrapped in a 3 5/8" crown that continues through out the room. 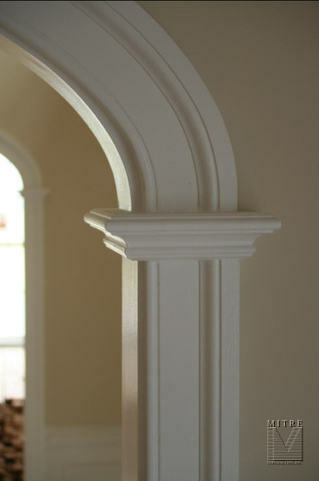 The columns also feature recessed panels and crown molding. We also applied some panel moulding shadowboxes in the window seat area for more interest. This was just part of a whole room renovation project / makeover. This bedroom improvement project also included the removal of a stippled ceiling, a double framed paneled beadboard wainscoting, custom painting with glazed accents, new electrical outlets, switches and cover plates. Please contact or call us anytime for a free in home consultation and estimate for your next home improvement project. 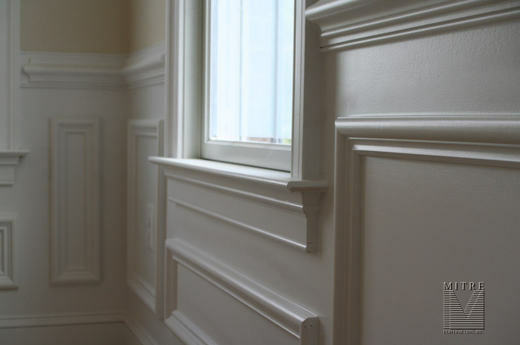 Here we highlight some pictures of double paneled beadboard wainscoting. This was part of a home improvement that included this bedroom makeover project we just completed in June 2010. This wainscot treatment consisted of a 1x4 framework all pocket screwed together, forming the 48" high double paneled system. This was then placed on top of 1/4" primed beadboard sheetgoods. Each individual panel section was trimmed out in a nice basecap panel moulding. 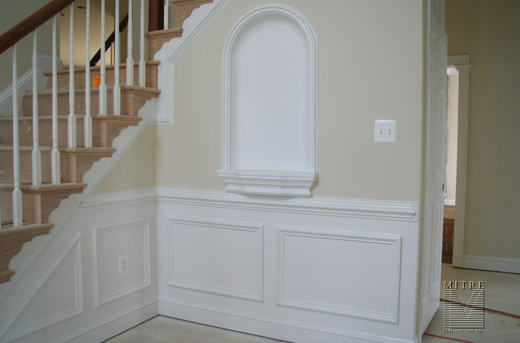 Then the wainscot was capped off with a two piece chair rail molding. It was given a custom paint job with glazed accents. 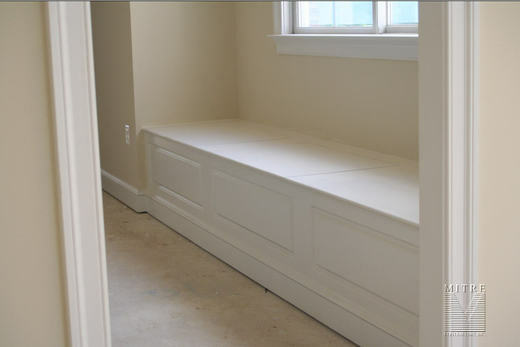 Also we rebuilt a window seat unit in the dormer niche area. 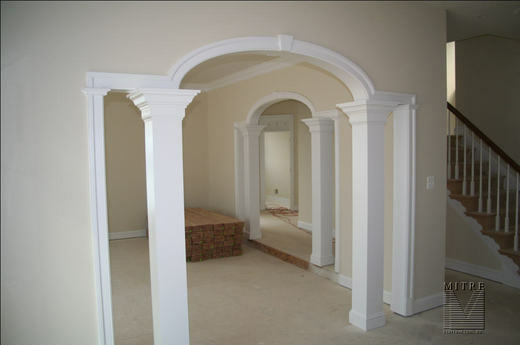 This features recessed column pilasters and archway. We also changed out all the old painted outlets, switches and cover plates with new ones. Notice the old stippled drywall ceilings. We had them scraped and then skim coated a few times to be smooth again. This page features some highlights of a new home we just completed the interior finish carpentry in last month. The balustrade utilized oak boxed newels with square balusters. I liked the way that the newels complimented the door and window casings. This house also featured a sanitary style casing with plinth blocks and entablatures on all the doors and openings. Please give us a call anytime if you would like us to provide you with a free estimate for any home improvement project you are considering. Here you can see just a few examples of some different custom cased openings we can build and install in your home. 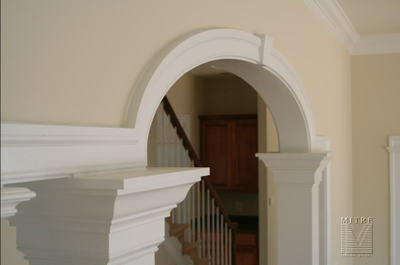 The possibilities are endless when you take into account all the different mouldings, features, and decorating styles. We encourage anyone who is thinking of having work done in their home, to gather pictures from magazines or websites that spark your interest. They help us get a better idea of your likes and dislikes, so we are better able to come up with a design that suits your preferences. The following picture shows a room divider / custom opening with a straight header, square fluted columns, a three-piece crown moulding build-up, 1/2 wall bookcases with adjustable shelves and applied shadowbox panel mouldings. 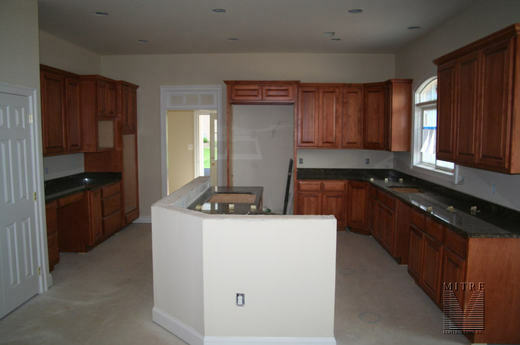 These have been just a small sample of some of the custom openings we have completed. If you would like something like this in your home, and you live in the Northern Virginia area, please contact us at your convenience. We would be glad to take a look at any ideas / plans / pictures you have, and provide you with a free, no obligation price quote. Some of the cities & towns we have worked in include: Alexandria, Annandale, Ashburn, Berryville, Burke, Catlett, Centreville, Chantilly, Clifton, Culpeper, Dale City, Fairfax, Fairfax Station, Falls Church, Franconia, Fredericksburg, Front Royal, Gainesville, Great Falls, Haymarket, Herndon, Leesburg, Lorton, Manassas, McLean, Middleburg, Mt. Vernon, Nokesville, Oakton, Purcellville, Reston, Springfield, Stafford, Sterling, Vienna, Warrenton, Woodbridge. 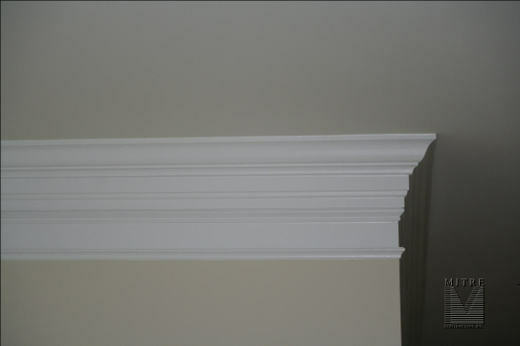 Just thought I would post a few pictures of some of the interior trim finish carpentry we just completed a couple weeks ago. This house is being built by Creekstone Communities. You can visit their website here: www.creekstone.com This was the first house we trimmed for them, but things went pretty smoothly for the most part. All the following pictures were taken during construction. You can see the stacks of hardwood flooring ready to be installed, and some of the granite counters haven't been installed. If get back over there I will get some pictures of the house after it is completed and all the flooring treatments, etc. have been installed. If you would like to know more about Mitre Contracting, Inc. and our finish carpentry & home improvement services, please don't hesitate to call or email me anytime. Take a look around our website to get a better idea of what we are all about. I would encourage any questions or comments you may have.